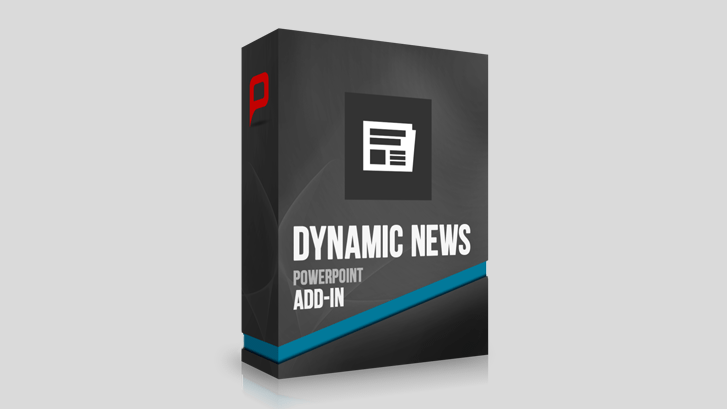 Install DynamicNEWS Add-In in PowerPoint to display messages, news, stock quotes or other text sources from the RSS Feed base and image files during presentations. This add-in provides dynamic integration of RSS feeds in PowerPoint presentations. The standard contents of an RSS feed are included individually in the elements of a presentation. The add-in bridges the gap between traditional PowerPoint presentations and breaking news. Dazzle your audience by displaying the latest news or economic developments at trade fairs, corporate presentations and other presentations. Its simple installation and operation allows rapid mounting and adaptation to individual applications. Use the add-in at trade shows, in corporate presentations with an integrated news ticker or in the financial world by viewing current stock prices and economic changes in a timely manner. You can also display text messages and image files. Note that the add-in must be installed on all computers on which the presentation is to be shown, so that the news display functions properly. With the add-in, you get templates in which feeds have been inserted and arranged. You can use the included templates or install customized feeds according to your own ideas.